Golf remains one of the most popular sports in the United States and increasingly, is shedding its traditional associations with exclusivity and affluence and becoming more accessible to all income brackets. According to the National Golf Foundation, there are 15,372 golf courses in the United States, which comprises 45% of all golf courses in the world. Additionally, there are over 2,800 standalone golf ranges in the United States and nearly the same number of alternate golf facilities in operation. As more people begin to take up the sport and the market matures, the demand for high quality golf courses and driving ranges increases. Both people new to the sport and old hats are looking for a golf experience that includes a well-maintained facility with excellent playability but also top-notch amenities and services. A 2009 survey of the American golfer conducted by Golf Magazine found that the average golfer spent about $3,000 a year on golf-related expenses. Of course, this number includes memberships, which represent vital revenue for the facility and its owners. Monthly memberships typically run from $50 to $100 and members usually stay committed to one club for a number of years, or perhaps a lifetime. As such, building customer loyalty to ensure these lasting customers is a top priority for golf clubs. Most of the golf courses and golf ranges are outdoors, as indoor facilities aren’t able to replicate the experience and natural features that most golfers enjoy. Granted, the typical facility presents its own set of challenges with greens maintenance, irrigation system upkeep and first and foremost, the lack of players during bad weather. Golf is at its core a fair-weather sport, which means both very cold and very hot temperatures prevent people from participating. However, peak seasons for playing are often spring and summer. While there is no quick fix for rain other than umbrellas, there are several solutions that make playing in hot weather more enjoyable. Even when the day is just warm, members seek relief from the sun, particularly after finishing a round. 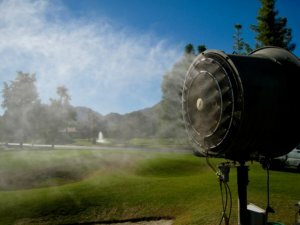 Incorporating a misting system into a clubhouse area can make warm to hot conditions comfortable for members and guests.